January 3, 2013 Where in the World is Santa Claus? Where in the World is Santa Claus? Just for the fun of it, I thought I would post some sales figures for my first app, Santa Snoop (since renamed to Where in the World is Santa Claus?). With Christmas behind us and sales unlikely to move during those non-December months, it seems like a good time to reflect. Santa Snoop sold 110 copies in 2012. That covers the cost of the icon. Hey, at least it’s a good icon! There was a modest advertising campaign for the app. Half of the sales were in the United States. 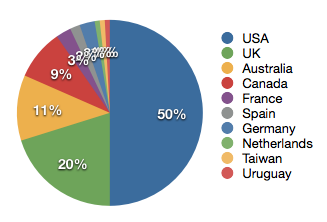 The other half was mainly in the United Kingdom, Australia, and Canada. The app saw a trickle of sales in non-English-speaking countries, namely France, Spain, and Germany, all of which had localized App Store pages and in-app content, but no marketing. The app also sold a little bit in Netherlands, Taiwan, and Uruguay, none of which had localized App Store pages or any marketing to speak of. Almost half of the sales were on Christmas Eve, with the rest being spread fairly evenly over December, including a few on or after Christmas. Any other “spikes” were due to marketing experiments or blog posts. It does not fit into a category. It is for kids, but it is not a game or a story. So what is it? Young kids like the app, but young kids don’t buy apps. Parents buy apps. When I explain the app to a parent, they often seem underwhelmed, as if to wonder what else the app does. When I put it in the hands of a kid, they tend to get excited and amazed. What matters for sales, anyways, is what parents think when they see it in the App Store. It is primarily an audial experience. It is not primarily a visual experience. The screenshots on the App Store do not sell the main feature, which is listening to Santa over a fuzzy radio connection to the North Pole. This does not come across on the screenshots. It’s other main feature is tactile. This is an augmented reality app which provides a special view of the world based on how you move the phone around. That also does not come across in the App Store. It does not have a lot of features. The app is very simple. Underneath, the app is actually pretty complex. It uses almost every sensor on the iPhone plus some interesting linear algebra and animation software. But (by design) the app seems simple, probably too simple. What does it do again? It did not work on all Apple devices. It only ran on the later iPhones, and also on some iPads (as an iPhone app). It did not work on any iPod Touches. This is all mostly for lack of a compass on those unsupported devices. It is not particularly useful. It does not solve a problem, and it is not educational. Nobody is really looking for this app. Even though sales were soft, it was still quite exciting to know that the app made some kids really happy. My own kids’ giggling and excitement over the app was thrilling. And hearing about other kids was amazing too. Also, it was kind of neat to reach out (if only in a limited way) to distant, exotic lands like Taiwan and Uruguay. And I learned a lot about developing and marketing iOS apps, both of which were areas of great mystery to me before. Santa Snoop developed from the core of a previous augmented reality app that got too big and complex to finish any time soon (say, this decade) on my limited time budget. So I am also glad that other AR app saw the light of day, at least in a scaled-down form. ← The first review is in!